1. Two Japanese scholars were selected as IUNS Fellows by the IUNS board of directors. 2. 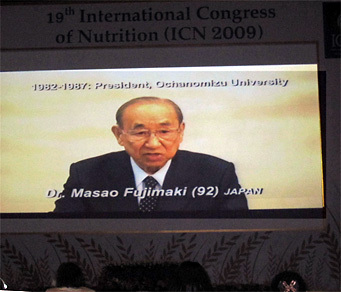 A video message from Dr. Masao Fujimaki, an honorary member of IUNS, professor emeritus at the Tokyo University and Ochanomizu Womens’ University, was shown during the Living Legends session at the 19th International Congress of Nutrition. Messages from internationally noted scholars in nutrition and food science were sent to younger scholars at the Living Legends session. Please use the player such as VLC if movie is not played well. 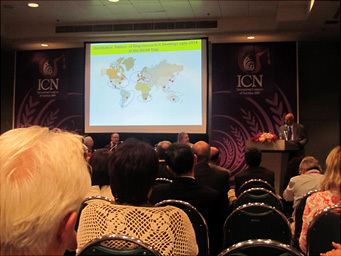 HRH Princess Maha Chakri Sirindhorm of Thailand, in the front row, attends the 19th International Congress of Nutrition. 3. Federation of Asian Nutrition Societies (FANS) selected Japan as host country for the 2015 ACN during its general meeting on October 7. President Po-Chao Huan, second from the right facing camera, announces selection of Japan as host for 2015 ACN. In the foreground, from left to right, are former president of JSNFS, Prof. Homma, current president of JNSFS, professor Yagasaki, and the chairman of the Bidding Committee, Professor Miyazawa. In addition to electing officials for the next term, members decided to hold the 21th ICN in Buenos Aires in 2017. For the selection of venues of both ICN and ACN, four countries were nominated, just like the Olympic election that happened a few days ago. 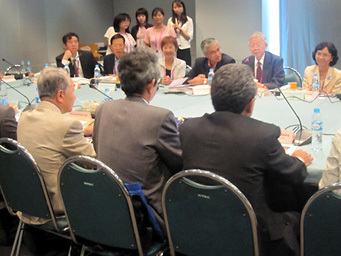 Organization of the young leaders’ workshop, scheduled for 2010, was discussed by a subcommittee of the Science Council of Japan. The preparation work will be done with collaboration of three organizations: the Japanese Society of Nutrition and Dietetics, the National Institute of Health and Nutrition, and the Japan Society of Nutrition and Food Science. Details from last year’s 2nd annual workshop, held in Korea, can be found in our magazine no. 61, pp. 310-311, published last year. TEL:+81-3-6902-0072 FAX:+81-3-6902-0073 Copyright © JSNFS All Rights Reserved.